This post has nothing to do with marketing. Well actually, it kind of does. 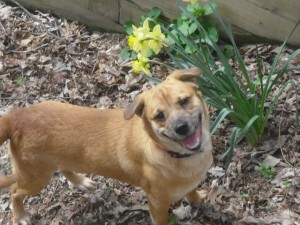 I am marketing and promoting a few great dogs in the Indianapolis area that are looking for a new forever home. It is no secret that I am a huge animal lover and I like to do whatever I can to help so I am going to start a new category in this blog called “Good Dogs Need Great Homes”. According to the IBJ, Indianapolis Animal Care & Control euthanized about 60 percent of the 18,000-plus animals it received at the city shelter last year and they are just one of the many shelters in the area. Any time I hear about a pup that needs rescued, I will post it in this category. If I can help even one animal find a great family for the rest of their life, I will be happy. 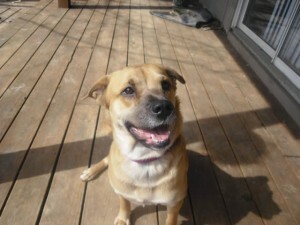 Katy (Keady for all of you Purdue fans) – UPDATE – KATY WAS ADOPTED ON 6-28-2010! Hi! My name is Katy. I was recently rescued from a shelter where it is overcrowded. I got out just in the nick of time! I am now living in a foster home and my foster mom and dad are in love with me and would love to see me go to a home that can send them updates on how great I am doing. I am a very sweet girl. The vet said that I am about 1 year old. I was found wandering the streets but everyone knows that I have had a home at some point because I know how to go outside to potty and I even know how to sit. My foster mom is working to teach me a few other commands. Sometimes I jump up to get your attention but my favorite thing to do is to flop on my back and get my belly rubbed. I should probably be in a house with older kids because if I get really excited, I might knock down a smaller kid. My foster mom is also crate training me so that I have a nice bed to sleep on during the day. I walk very well on a leash and love to go for a walk. I am living with a few other dogs right now. I like to play with them but if they get too close to my food or my toys, I might growl. I am not used to having good stuff and I want to keep what’s mine! I have also been known to chase a cat or two, so I might do better in a home without cats. Do you want to meet me? Call 317-417-7070. This was taken on Katy's first night at our house. 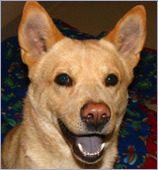 Buddy is a very friendly, intelligent and outgoing 4 year old lab/chow mix named Buddy. He has been at the shelter since Valentine’s Day of 2009 and is really starting to show the effects of the stress and tension. If you come to meet him do not be surprised if he is spinning in his cage as unfortunately that is how dogs cope with the stress. Don’t let that sway you from meeting him because it will be a wonderful surprise to learn all Buddy has to offer a family. 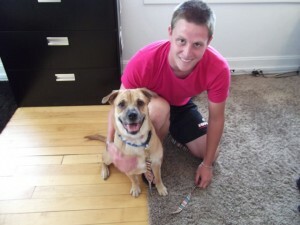 This guy loves meeting new people, gets along well with kids, walks wonderfully on a leash, and plays fetch. He knows the commands sit, down and shake. He is very treat motivated so the possibilities are endless on all the other tricks he can learn for you. Buddy does have separation anxiety, but this IS easily correctable if you have the time and patience. Buddy comes with a crate and a blanket when you adopt him and it is recommended that he be crate trained following adoption. He will learn that his family always comes back and it won’t be so hard for him when the family does leave. Or you can just bring him along: he loves to travel in the car. With his high sociability, why would you want to leave him home anyway? 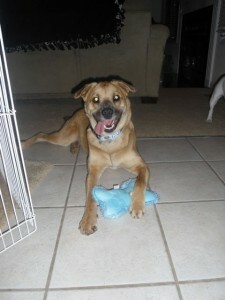 Buddy is a real charmer and a ladies’ man as he prefers female dogs in the home with him. Come by and spend some time with Buddy, he is neutered, house trained and ready to jump in that car with a tennis ball in his mouth and go home with you today. For those of you who remember the good ol’ days of search engine optimization, you know how dramatically things have changed. I remember that back in the 90′s, the goal was to jam your keywords in to a particular page as much as possible, as well as blanket your meta tags with every keyword imaginable. Today, the rules are much different. While there are many techniques and best practices that you can use to increase your search engine placement, here are a few tips to get you started. 1. DON’T think that adding keyword mega tags to the pages in your website will make a huge different in Google’s eyes. Google has actually stated on their blog that adding keyword meta tags to your site will not affect your ranking in their engine. DO created a targeted and description title and description for your website. This information is used to determine how your particular listing is displayed and while it might not help your rankings, it will help the user get a better idea of the contents of your website. Also, just because Google doesn’t use the keyword tag, doesn’t mean that other engines won’t. Try to keep your tag to around 15 keywords to less, with copy targeted to that particular page. 2. DON’T stuff your pages full of keywords from top to bottom. This creates a bad user experience and even if it helps your site move up in the rankings, you may lose the customer because the page is cluttered and unfriendly to use. 3. DON’T fall for link building scams. Have you ever received any of those random emails which ask you to swap links with a website that little or nothing to do with your website? These emails are typically sent from those who are building links in an intentional attempt to increase their rankings and Google frowns upon that technique. DO build quality relationships with other websites that may be of use to your website visitors. For example, we are currently working on some websites for a group of real estate agents. A great way to build a linking relationship is for them to contact some of their partners in the industry, such as mortgage companies, home repair businesses or moving companies, and ask them if they would like to add each other’s websites to their own as a preferred vendor. Not only will your customers appreciate the resources, but you will also show Google that your website is being promoted by another website. 4. DON’T create a blog just because you think you need to have one. Blogs can be a great way to add relevant content to your site but you need to be aware of the purpose of each post. DO post information that will be useful for customers who could potentially be looking for your company or business type and utilize the post tags function for each entry. Post tags are great way to tell the searches engines about the content of your particular entry so keep your top search phrases in mind as you are writing your copy.